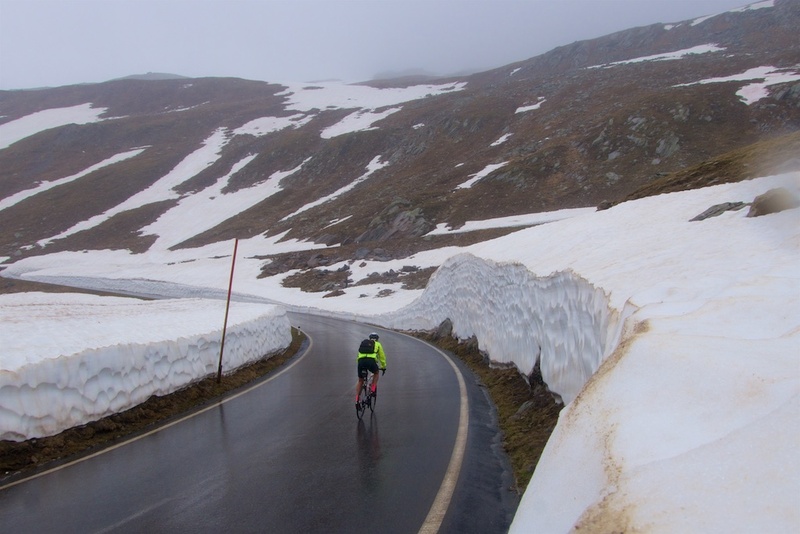 I was at the base of Timmelsjoch three years ago and a storm prevented me from climbing this super high road. So I wasn’t going to let a little rain bother me this time. 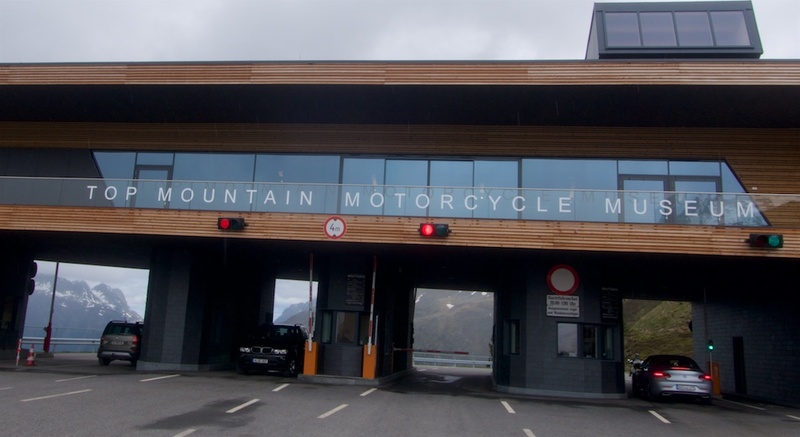 At 2474 metres, the pass is on the Austrian / Italian border, hence its two names. This is one of those high strategically located paths that has been used for travel, trade, and smuggling since at least the middle ages. 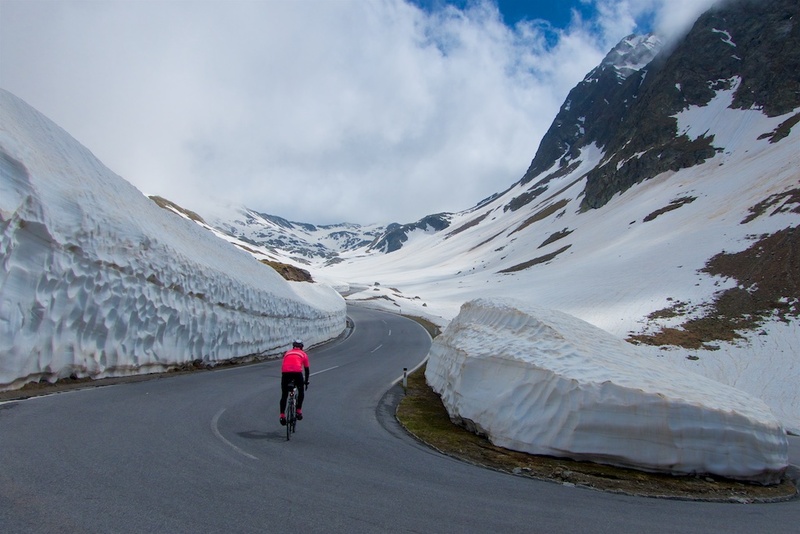 The paved road was completed in the late 1950’s on the Austrian side (Timmelsjoch) primarily for tourist purposes – there is a large ski resort lower down. The road on the Italian side (Passo del Rombo) was started by Mussolini for non-tourist purposes, but it was never finished to the summit. The longest tunnel (near the summit) collapsed and the road wasn’t open to traffic until 1967. My plan? Ride the Austrian side and descend the Italian side for at least 10 kms to enjoy its many hairpins, and then return (see map at bottom). One could start further away than Sölden but it’s a relatively busy road, not necessary. This is a wide, good quality, purpose-built ski station road. 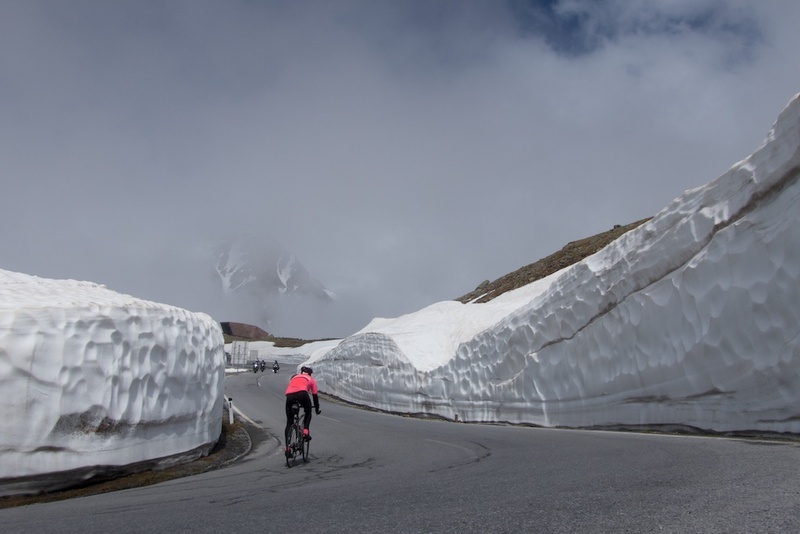 At roughly 2100 metres, before the downhill section, is a toll for cars. There is also, strangely, a motorcycle museum. From here, the Austrian side gets more remote and interesting, winding up a deserted valley. I knew the weather might not be great, and it began to rain as I approached the snow. Luckily, it’s tough to get too cold climbing such a huge mountain, but I was soaked. I was riding straight into the rain/wind and a camper van even asked if I wanted a ride. But as long as it was raining, and not snowing, I wasn’t too worried. As I briefly took shelter at one of the signed hairpins, a German tourist stopped and offered to take a photo. I soon reached the top. 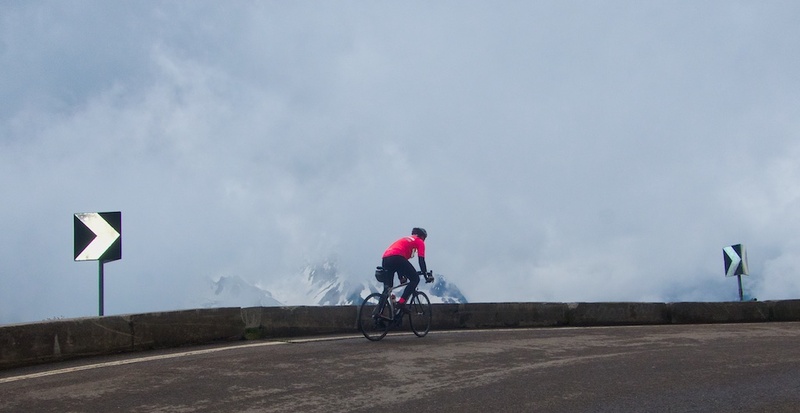 Some signs say 2509 metres, but the road “only” reaches 2474 metres. Fortunately, there was a small restaurant at the summit and a kind waitress took me to the one table beside a heater. A couple of cups of coffee and I was ready to go. I would descend approximately 11 kilometres into Italy, where the road flattens out, and then return up. 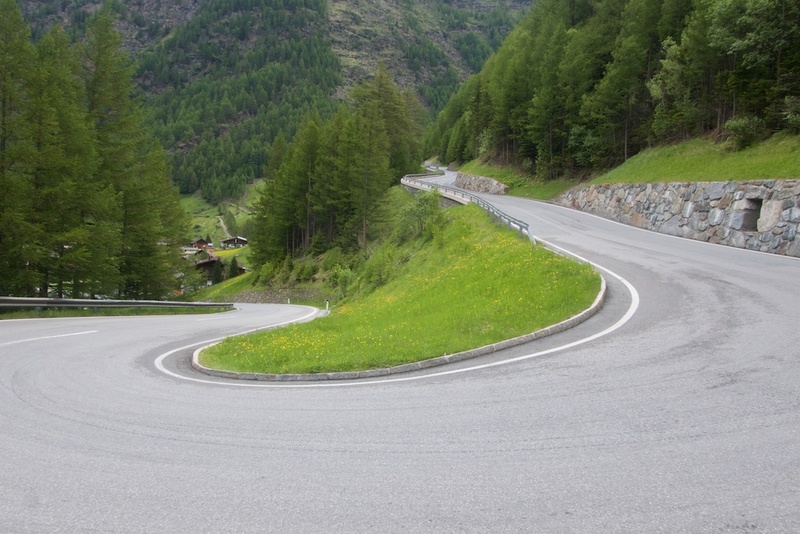 Some climbs number their hairpins. 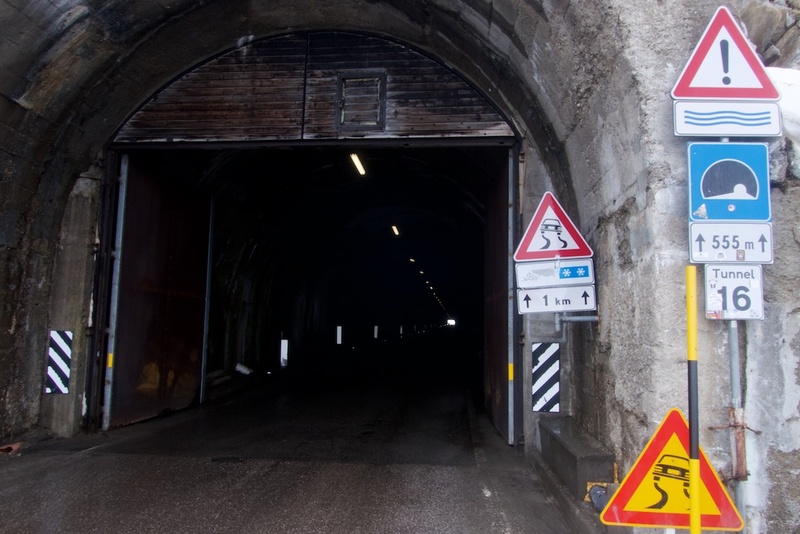 Passo del Rombo numbers its tunnels. And tunnel 16, not far from the summit, is over half a kilometre long. I briefly considered turning around given the fog, and how I hate tunnels. But I’d heard the Italian side was great, so I persevered. And I am so glad I did. I loved the Italian side, far more charming and crazy than the Austrian side. Most of it is a cliff road, full of hairpins and several tunnels (all small except tunnel 16 above). I had climbed part of the Austrian side with John, a very friendly Englishman who had ridden here from Denmark and plans to travel Europe on his bike until September. As I climbed he descended past and we stopped to chat some more. He was absolutely loving his highest ever climb. I reached the pass again and the sun appeared. 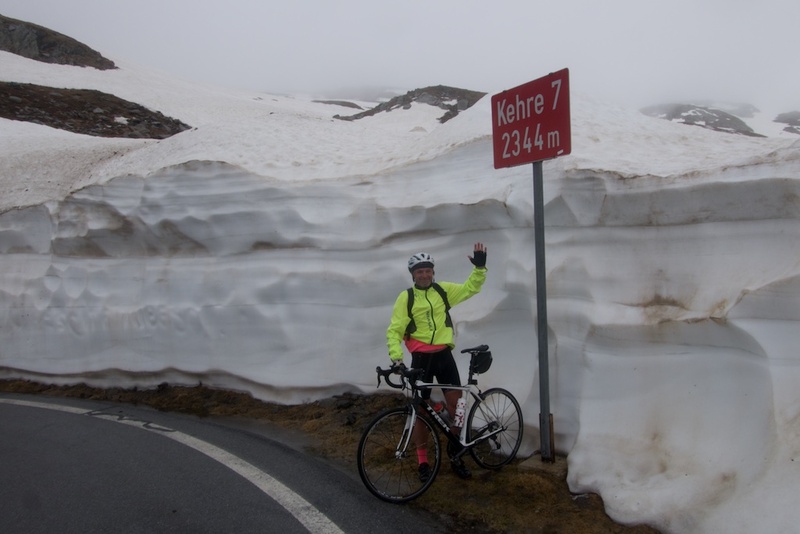 So as I descended back into Austria, I stopped for a couple snow wall photos. It’s much nicer when it’s not raining. 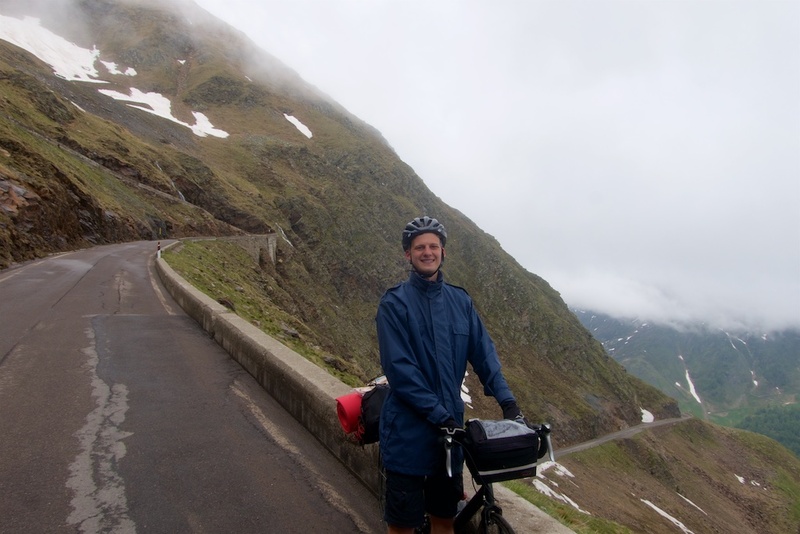 I was happy to not be descending in the rain, and it was an easy ride back to Sölden. I was pleased I had planned well with several jackets, leggings, etc. and survived a very minor storm with no problems. Such a fun mountain. 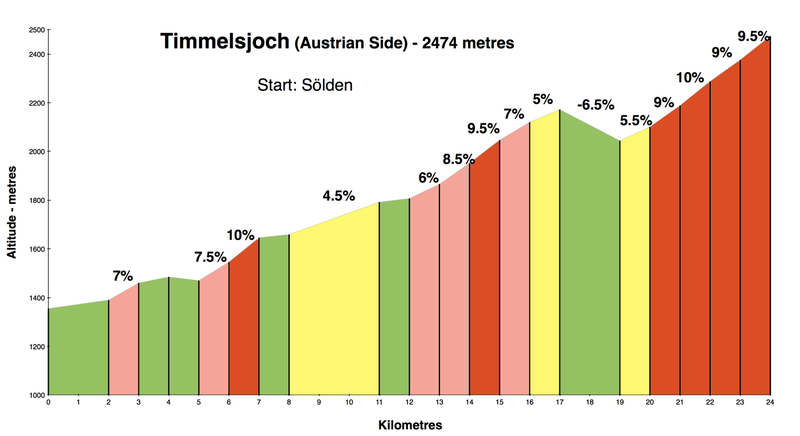 An even higher climb also starts in Sölden. The Rettenbachgletscher climbs past 2800 metres. Details here. Nice ride, Will! 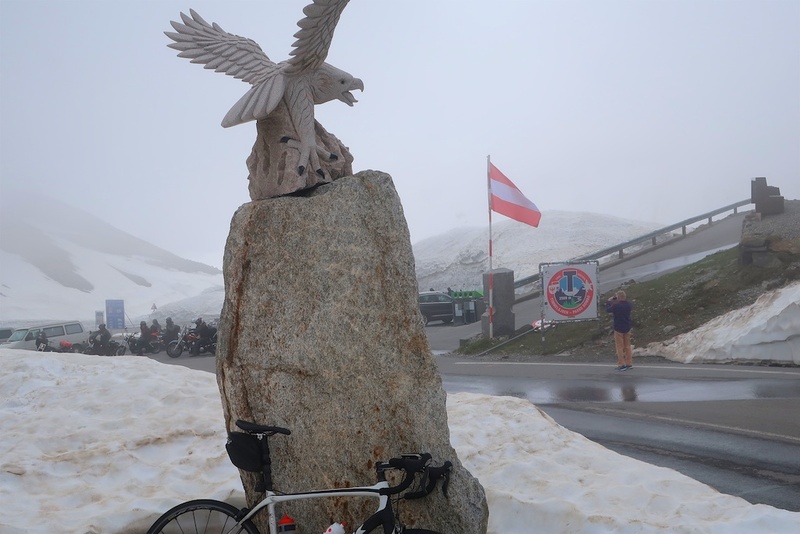 Last summer I did the full Italian side, 29 km and over 1700m of vertical from St Leonhard im Passeier. 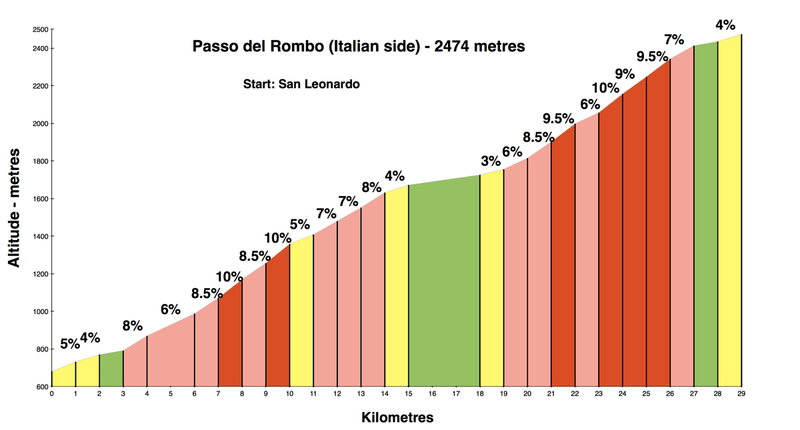 The last ten km are very Stelvio – esque. Awesome switchbacks. The tunnel wasn’t too bad, but right after it they’d torn up the pavement for maintenance. Fun.